Today, Ryan M. and Spencer are discussing Batgirl 44, originally released September 23rd, 2015. Today, Mark and Michael are discussing Batgirl 40, originally released March 18th, 2015. Mark: One of the seminal Batman stories, Alan Moore’s Batman: The Killing Joke, was released in March 1988, almost exactly 27 years ago. In that story, Barbara Gordon is shot by the Joker, paralyzing her and confining her to a wheelchair. The controversy spun out from Moore’s decision to use Barbara as a plot device has been defining her, for better and for worse, for almost three decades now. Today, Michael and Spencer are discussing Batgirl 39, originally released February 18th, 2015. Today, Michael and Patrick are discussing Batgirl 38, originally released January 14th, 2015. Today, Suzanne Drew and Patrick are discussing Batgirl 37, originally released December 10th, 2014. Today, Shane and Drew are discussing Batgirl 36, originally released November 12th, 2014. Today, Drew and Spencer are discussing Batgirl 35, originally released October 8th, 2014. Today, Patrick and Shelby are discussing Batgirl 32, originally released June 11th, 2014. Patrick: I was recently putting together a resume for a creative position, and I found myself completely unable to distill what’s special about me into a digestible collection of jobs and experiences. Just by virtue of being a human being for over thirty years, I’ve amassed a weird collection of skills and experiences, and the only reason I can believe that it’s all part of a single lifetime is because I was there to experience it all. I’ve got something of an obsessive mind, and a propensity to burn myself out, so my list of former passions is long. The point is, there’s a lot feeding into the person I am today, and while it’s easiest to say that I am the handful of things that have effected me most recently (i.e. : improviser, writer, comic enthusiast, administrator), that definition is woefully inadequate. 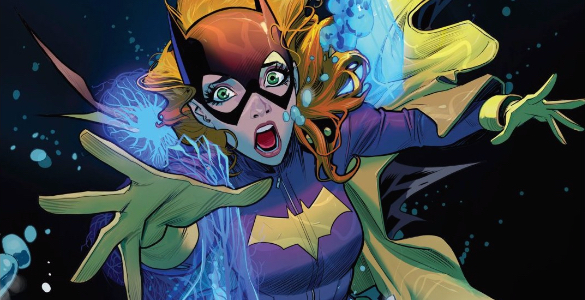 The same is doubly true for superheroes, and Batgirl 32 revels in developments from the recent past while acknowledging a history (both real and invented) that demands to be honored.